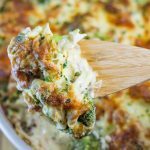 Keto Chicken Broccoli Casserole - " Cheese & Creamy" - Easy Hot Dinner Recipe! This Keto Creamy Chicken Broccoli Casserole recipe is super easy to throw together. It’s rich, "Cheesy and Quick Dinner" for a weeknight feast! Place a saucepan of water over high heat and boil the broccoli florets until al dente. Drain well and add to a large mixing bowl along with the shredded chicken. In a small saucepan, add the cream cheese, cream, almond milk, mustard, garlic, salt and pepper and place over low heat. Whisk until the sauce is smooth. Pour the warm sauce into the broccoli and chicken mixture, add the basil, and mix well. Pour the mixture into a casserole dish and top with the shredded cheese. Bake in the oven for 20-30 minutes, until warmed through and the cheese has browned.